Description Take up new tricky tasks and overcome dangerous challenges in Roads of Rome 2, an addictive game that successfully combines strategy and time management features! Caesar, the governor of Rome, has been poisoned, and there's no potion strong enough in the world of mortals that can cure him of his terrible disease. Caesar's daughter Julia is in despair and Victorius, an honorable general, sets out on a long journey to the kingdom of the Gods. 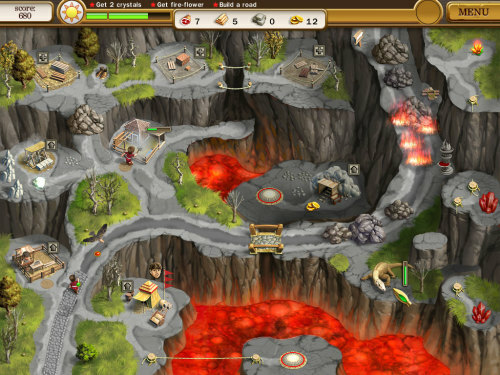 The lands of barbarians are full of dangers, so be careful! Clear up your way and build roads, leave gifts and offerings on the Gods' altars and help Victorius find the magic potion that will save Caesar's life. Your quest will be long and difficult, but if you succeed, the Gods are sure to smile down on the citizens of Rome! Shatter the peace and quiet of the Gods' kingdom and help Victorius accomplish lots of challenging tasks on his way. Glory to the brave warrior!